← Bust ups at Base Camp – the potential for trouble was clearly present while we were there…. Just back from a long weekend break to Mallorca, where sadly the much-hoped for sunshine failed to materialise, as the stormy weather from the UK kindly followed us over there. But luckily the island has much to offer, rain or shine, so I introduced the group to a few of my favourite Mallorquin pastimes that never fail me when the sun doesn’t choose to make an appearance! 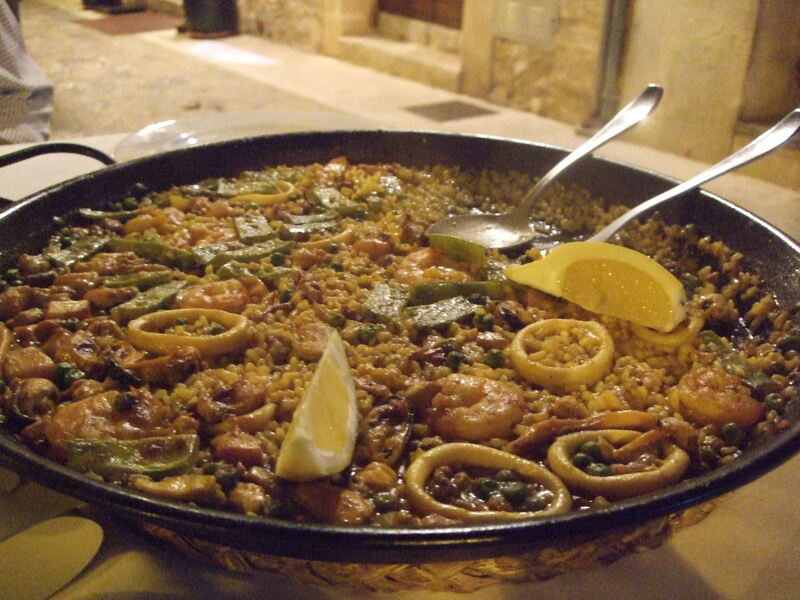 Shopping, eating and drinking…..
Let me walk you through a wonderful 24 hours of culinary pleasure, Balearic-style. We kicked off our first morning in the sunshine (the weather went downhill after this but a good start!). 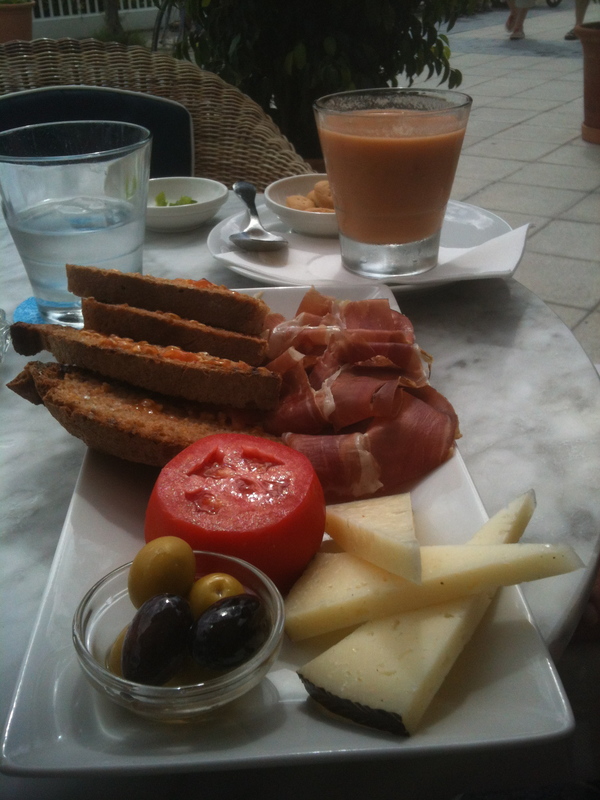 Breakfast at C’an Moixet at the top end of the square of Pollensa old town. A wonderful setting as the little town with its medieval streets starts to come to life – elderly Spanish ladies in black, wandering dogs, business men reading the local news, and, at this time of year, the occasional tourist…. Our breakfast order is for cafe con leche, fresh orange juice and the local pastry, ensaimadas, flaky, soft and dusted with icing sugar. In our family they are known as ‘esmereldas’, and the best versions (the ones served here!) are light and crisp but with a soft open crumb that’s just a little greasy because of the lard used in the baking. And like their close cousin, the croissant, the finest versions are a totally different gastronomic experience to the worst, which can be dry, tough and unpleasantly fatty. This is one of my favourite breakfasts of all time and well worth driving the few miles from the port to the old town for! And I usually walk up the Calvari steps and back down again beforehand, to make me feel I’ve earned my breakfast. Rain sends us into the local shops in the old town to browse wonderful jewellery, shoes and bags, and stylish summer clothes in the vibrant bright colours that are in for this summer. Neon oranges and pinks are in evidence everywhere! Definitely to be used as an accent colour rather than full on but great fun, if only we get some sunshine at home. 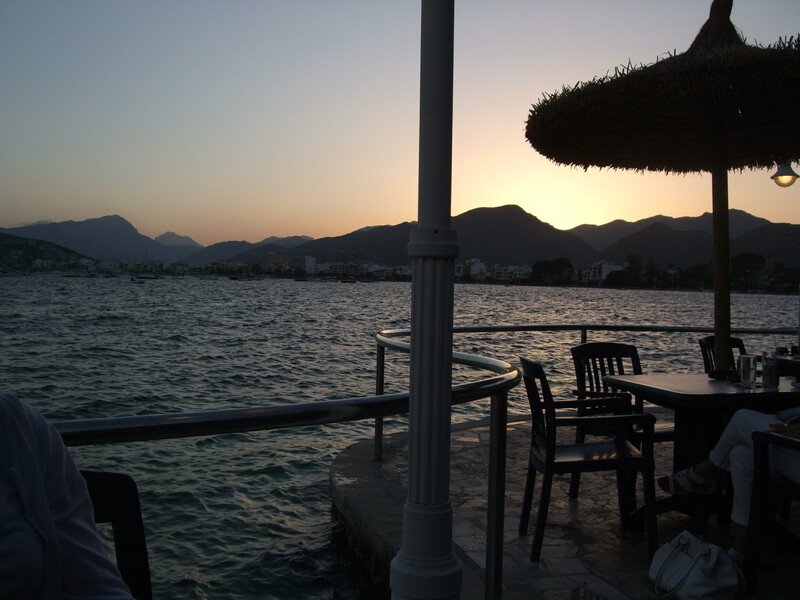 When the rain stops we head back to the port, Puerto Pollensa, for lunch on the bay. Local stylish cafe chain Cappuccino is now running the restaurant at one of our favourite hotels in the port, the Sis Pins. The outdoor cafe that runs down to the seafront is the perfect place for a little lunch and people watching. A new discovery – the dangerously addictive Hendricks g & t.
I’m enjoying introducing some of the friends I am with to the delights of the island. And Annie repays the compliment by revealing one of her secret summer pleasures. Before dinner we all come to appreciate the joys of gin and tonics made with Hendricks, a new gin distilled in Scotland, of all unexpected places. Out here it’s served killer strength in large goldfish bowl-like glasses with lots of ice and slices of cucumber. The flavour is fresh and clean but the cucumber takes away the bitterness that can come through with some G&T’s whilst adding a real taste of summer. We are all instant converts but served in such voluminous glasses, this is definitely an one-off treat! Back into the old town by cab for dinner at my favourite local restaurant, hidden away in the back streets. Palma has plenty of wonderful tapas restaurants, especially in the old area around the port but we don’t need to go that far, as the old town has La Fonda. Traditional dishes such as tumbet and a marvelous Dorada alla Mallorquin – sea bream wrapped in spinach leaves and cooked with pine nuts and raisins on a bed of sliced potatoes – sit alongside more familiar tapas, such as Padron peppers and little chorizos alla plancha. I usually have the arroz con negra – rice cooked with seafood in squid ink, but tonight we share a classic paella made with rabbit, chicken and seafood. It’s a perfect example of its genre, but huge so we take a doggie bag home so nothing goes to waste. Our paella is washed down very satisfactorily with glasses of chilled Xaloc, a lovely rounded white wine made locally outside Pollensa from a combination of chardonnay and sauvignon blanc grapes. Heaven…..
We are too full for any of the delicious desserts on the menu (and after this day of eating and drinking that may not surprise the reader) so it’s a cab drive back to the port and the Illa D’Or hotel – or rather the bar set out on a shady terrace under the pine trees by the gently lapping waters of the bay of Pollensa. It’s one of my favourite places to sit in the world, night or day. On a warm summer’s evening, a Baileys on the rocks (I know and I apologise, sometimes it’s a malt whisky or maybe cointreau) sipped whilst watching the moon shine on the water, and hearing the sounds wafting over from the Elvis tribute bar on the other side of port, takes a lot of beating. Tonight it’s not quite there as the temperature would not rank as balmy and there is no Elvis but it still hits the spot! Back to the house for coffee, tea and slabs of Milka chocolate that’s waiting for us in the fridge (I love going away with the girls!) and it’s the end of a perfect Mallorca day, even without the sunshine. And that’s why my family and I keep on coming back to this wonderful island…. 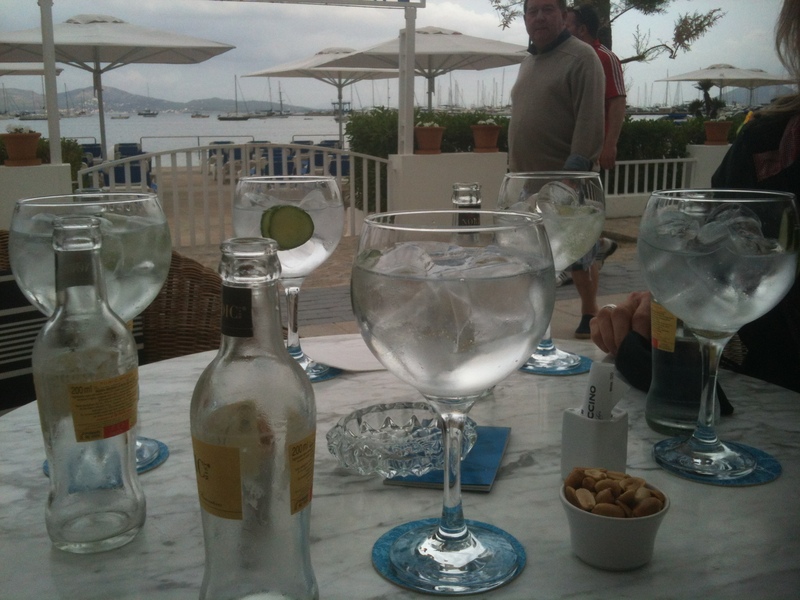 This entry was posted in Eating out, Travel and tagged eating out in Mallorca, ensaimada, G & T, Hendricks, Hotel Illa D'Or, Majorca, Mallorquin food, Pollensa, Puerto Pollensa, restaurants, Tumbet. Bookmark the permalink. It is nice to see you enjoyed the island and its pleasures even if the sunshine was not there. Thank you for this culinary trip. And if one day you want to go back to Majorca you can hire a car. Driving allows moving quicker and visiting much many places.